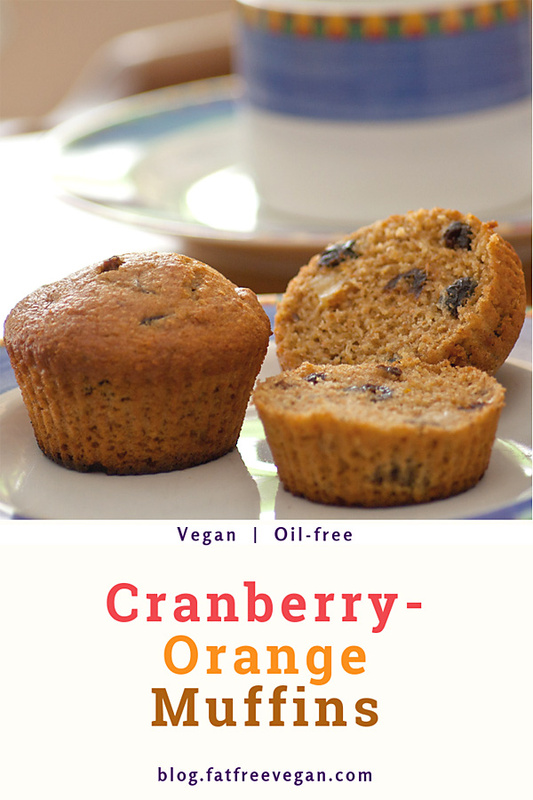 Sweet with a hint of tart, these vegan cranberry-orange muffins are tender, moist, and surprisingly fat-free. 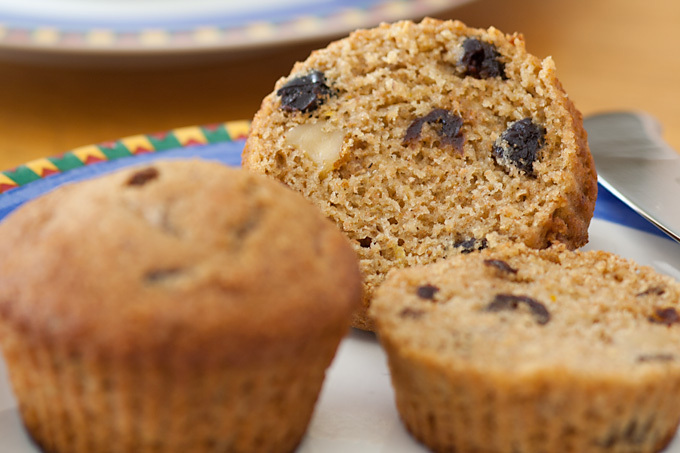 This is a tale of two muffins—or of how one type of muffin became two. It’s the same old weekend story. My daughter E. had her friend G. over for the night, and when morning came, they wanted nothing more than to get in the kitchen and help me cook breakfast. Cooking is their thing lately. Last weekend they came up with the idea to bake cookies and sell them on the street to raise money for UNICEF. (You can see one of the cookies, which were vegan but not fat-free, here and find the recipe here). The girls sold all the cookies and had a great time in the kitchen, so on Sunday morning they were eager to help me cook again. Eager…until I told them what I was cooking. “Ugh,” they groaned, and made finger-down-the-throat gestures. “Not cranberries! In muffins?” No amount of persuasion would convince them that cranberry muffins would be delicious. So we came up with a compromise: We would make the batter, and right before adding the cranberries in, I would scoop out some of the batter and let them add chunks of banana to it to make four banana-walnut muffins just for them. I do like being right! 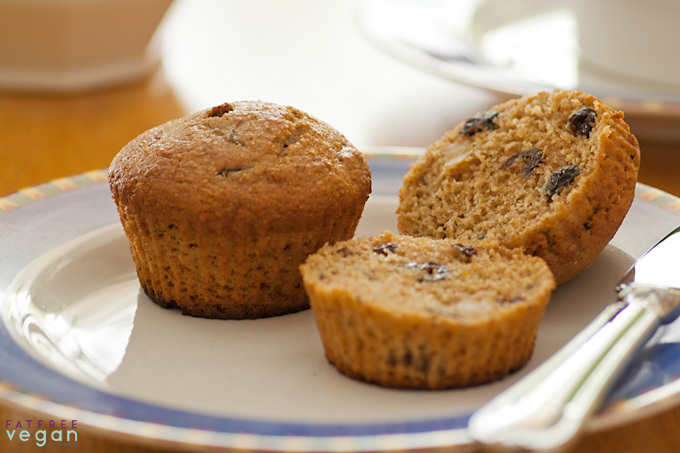 Sweet with a hint of tart, these vegan muffins are tender and moist. Put the cranberries in a bowl and pour the hot water and agave nectar over them. Stir and set aside for at least 15 minutes to allow the cranberries to plump up. Preheat the oven to 400ºF. Spray the muffin pan with non-stick spray or use a silicone pan or muffin liners. In a large bowl, stir together the dry ingredients: flours, flax seeds, sugar, egg replacer, baking powder, baking soda, and salt. In another bowl, stir together orange juice, soymilk, apple sauce, vanilla, and orange zest. Strain the liquid from the cranberries into the liquid ingredients. Make a well in the center of the dry ingredients and add liquid. Stir just to until all flour is moistened;don’t over-stir. Stir in cranberries and nuts. Spoon batter into prepared muffin cups. Bake for 12 to 16 minutes or until a toothpick inserted in the center of one muffin comes out clean. Remove muffin pan to a wire rack. Cool for 5 to 10 minutes before carefully removing muffins from cups. Makes about 14-16 regular-sized muffins. Nutrition Facts Nutrition (per serving, without walnuts): 123 calories, 7 calories from fat, <1g total fat, 0mg cholesterol, 210.2mg sodium, 85.2mg potassium, 27.1g carbohydrates, 1.8g fiber, 12.7g sugar, 2.7g protein, 3.4 points. Nutrition (per serving, including walnuts): 136 calories, 18 calories from fat, 2.2g total fat, 0mg cholesterol, 210.3mg sodium, 94.4mg potassium, 27.3g carbohydrates, 2g fiber, 12.7g sugar, 3g protein, 3.9 points. Sounds delish! Can this be made with fresh cranberries? If so, what would the adjustments be? These look lovely! I cannot have oranges or gluten think these would survive the adjustment? I have safe orange flavored craberries and figured i could replace the OJ with more rice milk? If i get to eager befor ehearing from you i will let you know how it goes :). Ended up making these tonight :). They came out very good, much better than any other gluten free vegan muffin ive ever attempted :D. I ended up using a combination of arrowroot starch, coconut flour, millet flour, and buckwheat flour plus guar gum. Next time i think i will do less buckwheat and eliminate the millet as it made them slightly bitter. I also subbed out the orange juice and zest for the orange flavored cranberries they still had a great flavor and were citrus free (subbed liquids with agrain milk). Some other changes i made was using maple syrup in place of agave, accidently doubled the egg replacer :p , added a tad more sugar and grain milk, and replaced the nuts with fresh fine chopped apple. The fresh chopped apple was actually intended to give extra moisture but the texture was a perfect replacment for the nuts! I know thats a ton of tinkering but but i think they came out pretty close to the originals just more allergy friendly. Thank you so much for giving me such a great base recipe that was finally successful! Hope this helps someone else dealing with allergies/intolerances :). I just printed out the recipe for your cranberry orange muffins. Even though I highlighted only the recipe, I got 7 more pages of stuff I didn’t need. Don’t know if it is anything you could control or not. I didn’t appreciate having to use 8 sheets of printer paper and all that ink. I wonder if you could set up a printer format for your recipes once print has been clicked or have a print option on your blog for just such times when one wants to print out one of your recipes-so that’s all we get! Sorry about that, Linda. I didn’t realize this recipe didn’t have a print version. I’ve just added it. 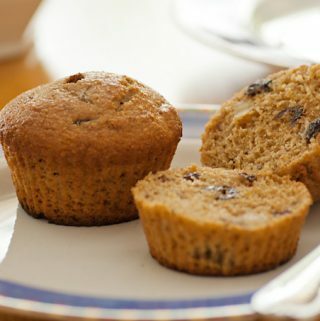 I made these muffins for breakfast today and they are delicious! I’ve been vegan for just over a year and hadn’t been able to find a good muffin recipe without a ton of oil. We thought we’d never be able to eat muffins again! Thank you, thank you, thank you! Hi! I just made the big transition from vegetarian to vegan (not so difficult actually!) and I’ve been perusing through online vegan recipes a lot lately. I noticed I am missing some of the essential baking and cooking ingredients, i.e. flax seed oil, agave nectar, etc. But in terms of this recipe, I was wondering if I could go without the egg replacer powder? …because all of the other ingredients I can easily find in my local grocery store. Hi E, congratulations of making the transition! I thin you could probably leave out the egg replacer, but if you have cornstarch, use a teaspoon of it and increase the baking powder by 1/4 teaspoon. Hope you enjoy them! Thanks Susan! I’ll be sure to let you know how they turn out 🙂 Thanks for sharing such great recipes! I’m new to fat free food. SIngle, cook my own stuff. Gotta be simple. So since you are the awesome cook you are, I was wondering if you would have any idea how to change these muffins into gluten free muffins? I have tried to just replace the flour with gluten free flour in other muffins, and it did not work so well. What would make the fluffier and more air in them. Thank you! I have made several fat free muffin recipes and my husband says these are the best! I have to agree, they are outstanding. I took whole cranberries I had frozen and dried them in the microwave, then did as directed in the recipe. Thank you so much for such a wonderful recipe Susan. It can be done without oil! Just made these – very good and very easy! I used 1 cup frozen (defrosted) organic cranberries since I had a package in the freezer. Next time I’ll up the sugar from 3/4 to 1 cup. Those babies are TART! Also I used the juice of 1 orange – was probably a bit more than 1/2 cup but I thought they turned out great. Otherwise I followed the recipe to a T. Thanks for a good one! Haha I think I know why you use dried cranberries (and on top of that, rehydrated in sugar water), I bet they are much sweeter! 🙂 These still turned out really great, I gobbled them up. Was hoping the sour cranberries would slow me down but nope! Thanks Susan. The ingredients you mentioned can be bought online from Amazon, and delivered right to your door. Susan’ s recipes are worth it!